Apparently the animal was cheated out of life. 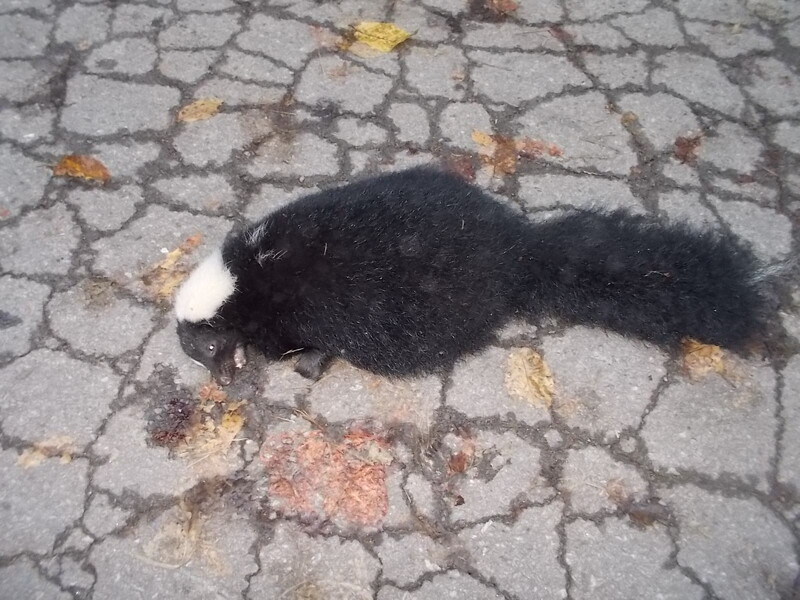 John and I spotted the lifeless skunk as we walked toward the curve in the road. We’re still pondering how he died. He had not been run over, so we guess he jumped up as a car was passing. Because of the curve, no one goes very fast at that spot. We also wondered why there was no telltale skunk smell, but coming back, we did get a hint of it. I looked for his white stripe and could not see it. Over the last year we asked all the neighbors what wild animals they had seen, and no one mentioned a skunk. We can all be glad it was seen when it could no longer contaminate the area. Wow – I wouldn’t have know it was dead if you hadn’t pointed that out. Thanks for sharing. One Christmas a momma skunk moved her entire litter under my Grandfather’s house. Those little skunks play just like other babies do – puppies, kittens – and they practice spraying when they do. Not to mention they are nocturnal. So at about midnight every night the week before Santa arrived, we were awakened by skunk stink. I don’t remember how he finally got them out, but we will never forget it. What a situation! Thanks for adding that.